Endophthalmitis is a severe inflammation of the interior of the eye caused by contaminating microorganisms that enter the eye following trauma or surgery, or that spread through the bloodstream from a distant infection site. Despite appropriate therapeutic intervention, bacterial endophthalmitis often results in vision loss and sometimes requires surgical removal of the eye. The study, led by Ashok Kumar, Ph.D., assistant professor of ophthalmology, anatomy and cell biology, microbiology, immunology, and biochemistry in the School of Medicine and Kresge Eye Institute at Wayne State University, will use a mouse model of bacterial endophthalmitis and cultured monocytes/macrophages to study the role of a metabolic gene AMP-activated protein kinase (AMPK) in regulating innate responses in endophthalmitis. Kumar and his research team will investigate the link between AMP-activated protein kinase-regulated energy metabolism of monocytes and macrophages, and their role in regulating innate responses in bacterial endophthalmitis. They hope to identify novel pathways and new means to treat blinding ocular infections. Because of an aging U.S. population and the increasing prevalence of antibiotic-resistant bacterial pathogens causing ocular infections, this study is of critical importance, as it may lead to the development of new anti-inflammatory therapeutics for the prevention and/or treatment of bacterial endophthalmitis. 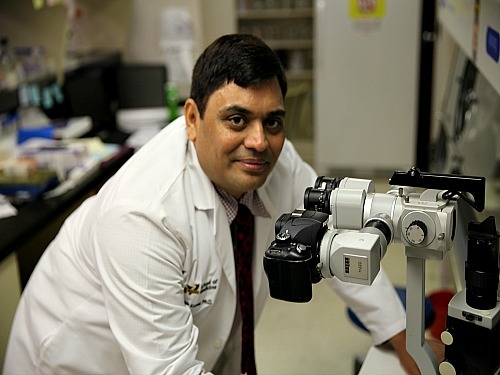 “We are optimistic that the anticipated findings of our research will spur activity into the development of approaches to manipulate the newly identified metabolic pathways to affect macrophage function in clinically relevant settings, ultimately reducing the number of patients with endophthalmitis through new treatment approaches,” said Kumar. The grant number for this National Institutes of Health project is EY026964.